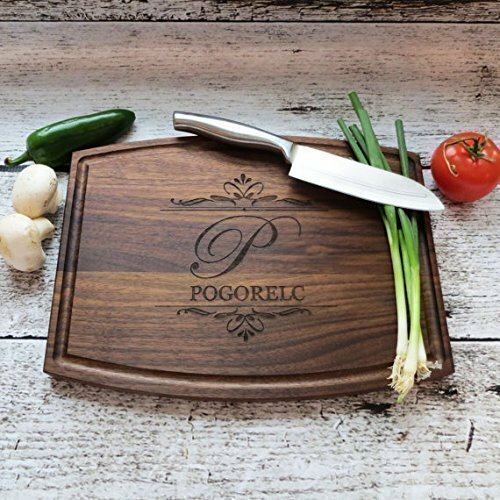 My personalized Walnut or Maple Cutting Board makes a wonderful Housewarming gift. Custom Wedding gift. Unique anniversary gift. My boards are of the highest quality and made here in the US with all natural wood. Each piece will vary with the grain of wood. Your board is finished with a natural oil solution with no stains or other toxic solutions and comes complete in a rustic burlap gift sac. The board in photo is walnut, but please choose your preferred wood in options. Typical turn around time for my boards is 3-5 business days. This board measures 9" x 12" x 3/4" and will be engraved with the design in the photo. If you have your own design or logo you would like to use, please message me and can be done for no added cost. My boards are all reversible and can be engraved on the side of your choice. 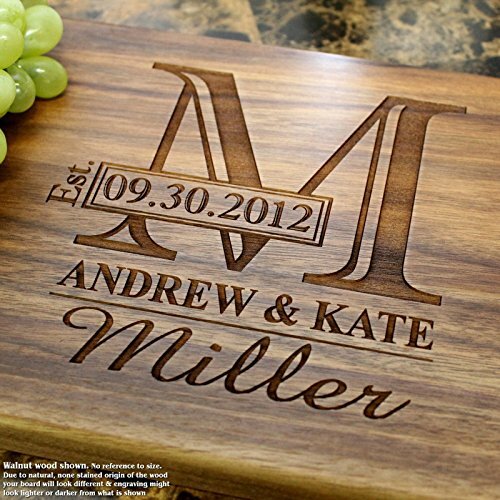 Please let me know if you prefer to engrave the cutting side with juice channel or blank side to preserve your art work. With the design in the photo, the Large letter is the prominent initial and represents the Last name.